Susan Ferguson aims to take her fiber arts career to the next level by exhibiting her tapestry weaving in a group exhibition at the Leedy-Voulkos Art Center in 2019. In order to work at a larger scale, Ferguson is acquiring a 48-inch rigid heddle loom to weave a collection of works that focus on contemporary environmental concerns. 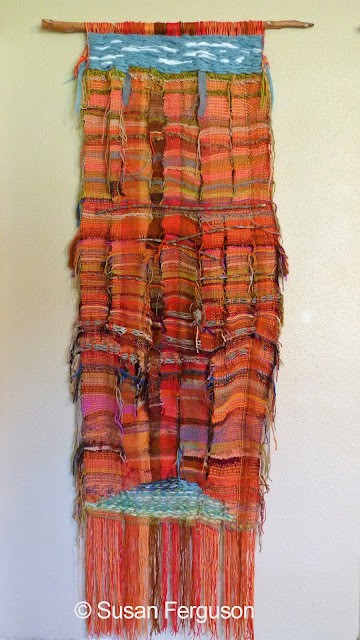 Ferguson uses traditional, non-traditional and natural materials in her abstract tapestries, such as yarn, twine, copper pipe, wire, plastic bags and bottles, recycled clothing, and discarded auto parts. 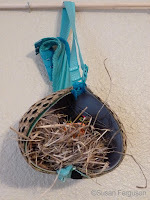 Her distinct combination of weaving and assemblage will allow audiences a visual and tactile experience of the impact of humankind on various environments. Ferguson’s goal is to promote fiber art as a fine art that offers fresh perspectives on issues and ideas. Local members of the Kansas City Fiber Artists group will also take part in this three-month show. Grant funds will be used towards a 48-inch Ashford rigid heddle loom and stand, and weaving materials. I'm really excited about this opportunity to do big things during the rest of this year and in 2019. Taking up space on the planet is harder work than I anticipated. I'm a fiber artist, a weaver, a writer, an editor, a grandma, a neuroscience junkie, and a big fan of the deserts in Arizona.